On a light-hearted note, have you ever contemplated the difference between Saint Nicholas and Santa Claus? There are distinct differences in religious and commercial symbolism. Find out more about the Origin of Santa, including an in-depth look at The Saint Nicholas Center. Now, considering the analogy, do SCI-Arc students want leaders more like Saint Nicholas or Santa Claus? Can you say "Cult of Personalities"? 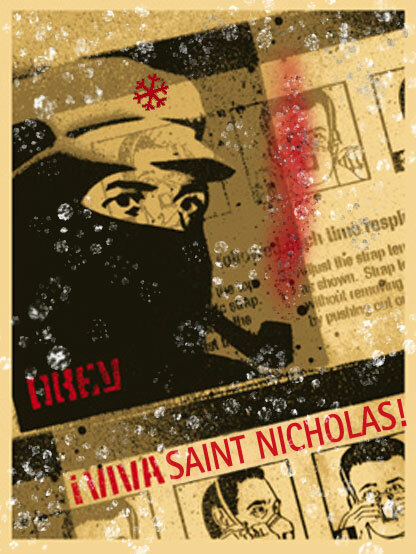 MARCOS as St. Nick | Do we need liberation? "Marcos is the leader of ther Zapatistas who are fighting against the Mexican Government because of years of unfair treatment of the people of Chiapas. The Chiapas Media Project provides cameras to members of the Chiapas community to document the unjust actions of the Mexican Government soldiers. Without the media, the Zapatistas would have been violently erradicated without the rest of the world even knowing." THE GIANT as Santa Claus | Do we need authority? 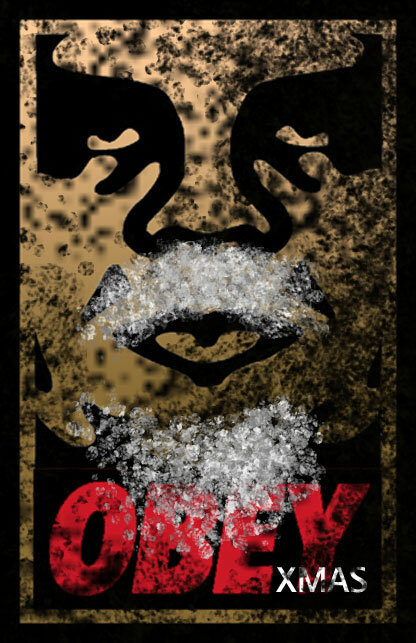 "The OBEY sticker campaign can be explained as an experiment in Phenomenology. Heidegger describes Phenomenology as "the process of letting things manifest themselves." Phenomenology attempts to enable people to see clearly something that is right before their eyes but obscured; things that are so taken for granted that they are muted by abstract observation." "Merry Chirstmas to all and to all a good fight..."
can you describe, more specifically, the concerns of the student body? what instructors? what's wrong with the curriculum? I can only speak for myself, and again, I'm fairly happy with things. Although, I'm not so happy with the commercialization of St. Nicholas. Phenomenology is soooo Deepak Chopra. to clarify, I am not bitching... just representing a (large?) portion of students that want change, not necessarily a revolt. not "reporting" what is/has been going on at sci-arc over the last week would be poor blog-etiquette. simply stated, a lot of emails were flying around, constructive and destructive... some of which were looking for the top 3 agenda items for a student-called "all school meeting" to be held at the start of next semester (January). this, combined with some anonymous -- dare I say rogue -- emails to the administration, spawned impromptu student gatherings and an immediate "all school meeting" led by EOM and the undergrad and grad "heads", Genik and Fung respectively. for a good portion of us, this admin response inflated the normal course of student discussion into political defense tactics -- the genesis of the "wide-spread" interest -- not necessarily the steadily forming student concerns for the January meeting. because of the admin disconnect (EOM and our program "heads"), including many studio no-shows and semi-pompous attitudes, students are seeking a clearer voice. my concern is: should "star-chitects" hold these administrative positions? they can build -- but can they build a school? in his defense, Moss made some decent points about his political prowess, but why the haste in calling the meeting? it seems odd to ask students to present their concerns with one day's notice when these same "heads" are not much into being a family -- which SCI-Arc prides itself in being and is one of the main differences between our institution and collegiate programs.